certain times of the year while another industry's traffic increases. Based on that information, you may wish to explore cross promotional opportunities to drive traffic back and forth. 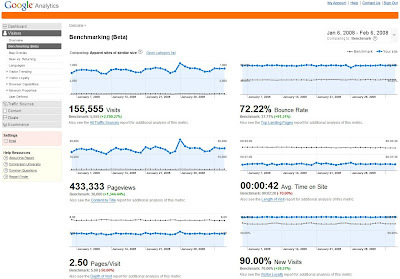 For more information, take a look at the benchmarking FAQs in the Google Analytics help center. Of course, benchmarking only works if people can opt to share their data into the system, so we're also introducing a new data-sharing settings page. On this page, customers can choose whether to opt in or opt out of sharing their Analytics data. To be clear, we are not sharing individual data with competitors; we bucket data into industry verticals and then anonymize and aggregate the data. Once you opt in, it may take a couple weeks for the reports to populate. You can also elect to share your data with other Google services. This setting will allow us to provide you with additional advanced new features. For example, many of you have asked us to integrate Conversion Optimizer (which is currently only available to AdWords Conversion Tracking users) into Google Analytics. By opting to share your data with Google, you'll be able to take advantage of these related new features as they become available. For more information, take a look at the data-sharing options FAQs in the help center. Look for tomorrow's post on the Audio Ads integration. We're happy to announce the launch of two related new Google Analytics features: a beta version of industry benchmarking and a data-sharing settings page. Both are designed to give our customers more choice and better control over their data. We are also launching an integration with Audio Ads today, which we'll discuss in more detail in tomorrow's post. All of these features will begin appearing in customer accounts today, though benchmarking reports may take up to a couple weeks to show data. You can also compare your site against an industry vertical different than your own. For example, you might see that your industry's traffic dips at certain times of the year while another industry's traffic increases. Based on that information, you may wish to explore cross promotional opportunities to drive traffic back and forth.